If you’re looking for the best information around on customizing your personal computer with a new, after stock CPU Cooler, you’re in luck! We’ve done the research and created this comprehensive guide in order to help our fellow computer enthusiasts and gamers find the best CPU cooler for their particular needs. CPU cooler replacement is one of the easiest, and most common, modifications that PC users can start with. It has the potential to increase your machine’s performance quite dramatically. And who doesn’t want better performance from their PC? Why Do You Need a Cooler for Your CPU? The short answer – because your PC produces a lot of heat and you put a lot of stress on your CPU when multitasking or using demanding software on your PC. More seasoned computer builders and tinkerers that have already installed the best SSD, RAM, CPU, etc. that money can buy will obviously be more comfortable paying for high-end coolers that will truly protect their gear. There is a great variety of coolers so that you can find the right one to cool your system. The CPU Cooler can’t accomplish all of this cooling all by itself, however. It requires the assistance of a heatsink. What is a Heatsink and How Does It Work? A heatsink is a thermal conductor which is commonly used in electronics of all sorts in order to create a state of equilibrium in which the heatsink gets hotter as the processor is cooled. You need to have some sort of air or liquid to cool the heatsink, however, or the heat will simply continue to radiate back on the motherboard, CPU, and other parts. The most effective heatsinks are comprised of copper base plates with thermal paste spread across their surface. It’s critically important that you sufficiently cover the plate with the paste. The majority of CPU coolers come with a tube of reasonable quality thermal paste, but you can shop around for something better as well. In short, there are 2 types of CPU coolers that are currently in use: air CPU coolers and liquid CPU coolers. There are several other technologies used for cooling but at this point, they aren’t available for the mass market. Air CPU cooler is the simplest way of keeping your CPU from overheating. Decades after their invention, we’re still using them in our PCs. Why? Because they work very efficiently and require little power. Air CPU coolers work by driving cool airflow around the heatsink in order to cool it continuously as it is being heated by the CPU. When high-quality air CPU coolers are paired with top-notch PC cases, you have yourself a highly-potent combination that will allow you to overclock in peace and quiet. Liquid CPU coolers weren’t available to the public until the late 90’s, but innovative techies were making their own liquid cooling systems prior to that; mainly out of the aquarium and automotive parts. Fortunately for you and me, they’ve since become commercially available. Liquid coolers are popular for a few reasons: performance, wow-factor, and noise level. As far as performance goes, it isn’t necessarily better than a good air cooling system, it’s just an alternative option. A liquid cooling system is comprised of one or more water blocks, a radiator, a pump, and a small internal fan. The liquid is pumped from the block through the tubing, transferring heat away from the motherboard, CPU, etc. This is possible because of the high thermal capacity of the liquid used in these systems. The details of how the liquid is forced into a turbulent flow as opposed to laminar flow to increase heat transfer are a bit tricky but interesting. If you’d like to learn more about the physics of liquid cooling, the following article “Air Cooling vs. Liquid Cooling” is a great resource. The number one reason for switching out your PC’s CPU cooler for a more advanced model is to enable overclocking. If you’re not familiar with the term, that’s okay. That’s what we’re here for after all! Modern processors typically run between 3-4GHz with no modification or alteration to settings. The level of GHz dictates the processing units speed. You can alter your settings so that your CPU becomes faster, but this leads to higher volumes of heat which must be dealt with in order to prevent damage. Which is why you need an upgraded CPU cooler if you want to overclock your PC safely. This is a big one for the average PC user. Lower end air CPU coolers can be quite noisy, particularly while multitasking and really putting that processor to work. Aftermarket options are more efficient, meaning they don’t have to work so hard (less strain = less noise). Many of the aftermarket CPU coolers available also provide multiple setting options so that you can turn them down, making them even quieter. When you purchase a new internal PC component, it should indicate how much heat it will produce while in use so that you can analyze whether or not the CPU cooling system you’re using will be efficient, or if you need a bit more cooling power to accommodate the new gear. If you enjoy gaming on your PC or make a living as a graphics designer, you’re already well aware of the effects of running powerful software. RAM and CPU are the main components that can to increase your PCs ability to handle high software requirements. Here is when aftermarket CPU cooler can become handy. If your PC has already suffered the consequences of inadequate system cooling, it’s definitely time to replace your CPU cooling system. Make sure that this is the first part that you take care of replacing, no matter what is damaged. That way, you’ll have your coolant system in place and ready to protect your other new parts as they’re installed. So far, we’ve covered the different types of CPU Coolers, how they work, etc. but we haven’t talked about CPU Cooler orientation within the case; which is a very important part of how they function. This type of a CPU cooler can be installed in two different positions, each of which provides its own set of pros and cons. The first position pulls air from the front of the case to the back and integrates a vertical heatsink. The second position pulls air from around the CPU, pushing it directly across the video card area and out through the top. To learn more about the differences in orientation for Tower CPU Coolers, check this article. Downdraft CPU Coolers obviously provide a downward draft of airflow, pushing air down and allowing it to naturally rise on its own. The most common reason for PC users to prefer a downdraft model is that they are seeking a low profile CPU Cooler that will fit inside of their case easily. Now that you know a bit more about the different CPU coolers that are available and how they work, you’re almost ready to start shopping! But first, let’s go over some quick, helpful tips for choosing the best air and liquid CPU coolers out there. Before you start looking at cooler systems, you should check your other internal PC parts to find out how much heat they’re expected to produce while running at max capacity. You need to know how much heat you’re sinking and transferring away in order to decide how powerful of a cooling system you will need for your PC. CPU coolers can get a bit expensive at the higher end of the product spectrum, and you wouldn’t want to spend $300 on your cooling system when you only need $50 worth of cooling power; or vice versa. Some things to consider might include; clock frequency, circuit voltage and complexity, and the material that the circuits are made out of. If you are in a pursuit of the CPU cooler that has a performance equal or near equal to the liquid coolers, there is no better choice than the Noctua NH-D15. Although it is expensive, this cooler will blow you away, both with its exceptional cooling abilities and extremely low noise levels. Compatible with all the newer Intel and AMD platforms and equipped with the dual tower heatsink with six copper-made heat pipes and two 140mm fans that provide amazing airflow effectiveness, Noctua NH-D15 presents a great option for any high-end rig. When we talk about the quietness of work, even at full load, this great piece of hardware outperforms the majority, if not all of its competitors. Also, it comes with a 6-year warranty and great quality build that Noctua is already known for all around the globe. All in all, Noctua NH-D15 presents an ultimate solution for die-hard overclockers and people looking for the best possible combination of silent performance and efficiency. For everyone looking for a cooler that offers premium performance and overall proper value for the money (although it is expensive), be quiet! BK022 Dark Rock Pro 4 comes as a reasonable option. High-quality build combined with its imposing design makes this cooler a welcome part of any serious PC configuration – of course, if you can fit it in, since it has rather large dimensions. 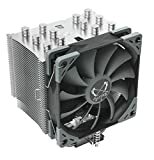 On the other hand, this cooler is easy to install and has two Silent Wings PWM fans (one 120mm and one 135mm) that have a maximum speed of 1200RPM and offer almost no sound action. It also has seven heat pipes made out of copper, for top-class heat dissipation and comes with a decent 3-year warranty. In other words, everything you would expect from a cooler of this class is there. A minor problem is its weight and the already mentioned dimensions, but other than that, if you want a top of the chart performance, be quiet! BK022 Dark Rock Pro 4 is the right choice. Before any purchase, straightening the priorities is essential, especially if you are dealing with a product such a Cooler Master MasterAir MA610P that, on one side, offers very silent operations and fancy lighting, and mediocre performance on the other. If you want the top of the class performance before anything else, you’d better go for something else, because with this one, you just won’t get it. Cooler Master MasterAir MA610P, with its 6 heat pipes and two 120mm Master MF120R fans, equipped with LED lighting (offers 6 pre-set modes, 5 brightness levels and 7 colour levels) and speeds of 600-1800RPM, may sound great, but actually, it only delivers the good looks. Cooler Master MasterAir MA610P is flashy and quiet, it offers compatibility with almost all the Intel and AMD sockets, it is easy to install, has a fair price, but its thermal performance is, to say the least, questionable. If you are just in it for the looks, go for it. Otherwise, just go for another product. 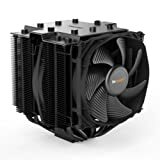 If you are looking for a decent product that will deliver silent performance and be a quality upgrade to your stock cooler, Scythe Mugen 5 Rev. B is the alternative to be considered. Affordable, with very low noise levels, this cooler offers decent, average cooling performance that will do the work and satisfy the majority of mainstream users. Equipped with a single 120mm PWM fan that has a rotating speed of 600-1200RMP and a bracket for another optional fan, alongside the six asymmetric nickel plated heatpipes made out of copper, with a great clearance and full compatibility with the majority of sockets, both Intel’s and AMD’s, Scythe Mugen 5 Rev. B is a smart choice for people who value every cent. If you want the premium, you won’t get it with this one and for this price, but if you want a fair value for the money and decent thermal efficiency that will suit most people, Scythe Mugen 5 Rev. B is a great option. Finding an affordable, but high-quality CPU cooler that will serve well even within more demanding overclocked machines is never easy, but Enermax ETS-T50 does it flawlessly. Compatible with all the modern socket types and supplied with the unique Enermax Vegas lighting (36 diodes with various LED modes), this cooler doesn’t just deliver the quality performance that is sufficient even for the heavy overclocking machines, but also delivers a one of a kind look that draws everybody’s attention. Enermax ETS-T50 comes with a single 120mm fan that has a rotational speed of 800 – 1800 RPM, has five copper made heatpipes for better heat distribution and incorporates Dust Free Rotation technology that automatically keeps the dust away. Enermax ETS-T50 is easy to install, offers great value for the money and generally is among the best CPU cooler options out there, with the proper combination of price, performance, looks and the X-factor. Assassin II comes as a next generation of the very popular Assassin I cooler that was a real “killer”. That legacy made things a bit harder because the expectations were already high, but luckily this new generation brought numerous improvements, and more importantly, it retained its quality heat dissipation. All of that is achieved with the help of an asymmetric two-tower heatsink that is equipped with 8 nickle-plated heatsinks made out of copper and two FDB PWM fans (one 120mm and another 140mm), with special rubber coating that achieves rotational speeds of 300-1400RPM. Other than the great heat treatment, Assassin II also delivers very silent work and offers support to almost every type of socket, both Intel’s and AMD’s. Quality build, ease of installation, top-notch performance – this cooler can be a great addition for any overclocking enthusiast and die-hard gamer. Its only downside is its weight, but that is something you can surely live with, especially considering how high-quality the DEEPCOOL CPU Cooler Assassin II is. ARCTIC Freezer 33 Esports Edition is one more CPU cooler that uses the well-established tactic of combining decent performance, good looks and affordable price in order to attract customers. Its construction includes dual, low noise 120mm fans, with rotational speed of 200-1800RPM and four heatpipes that, along with its color theme (black/red, black/yellow, black/white or black/green), give ARCTIC Freezer 33 Esports Edition a unique presence. Of course, ARCTIC Freezer 33 Esports Edition also has a couple of more aces up the sleeve, such as the 10-year warranty and the excellent clearance that allows for easy access to the rest of the hardware in the case. Unfortunately, there are also some downsides, such as limited socket support (supports all the mainstream Intel sockets and only AM4 AMD) and a bit lower performance in the case of heat dissipation, but on the other hand, it has a much better price than the direct competitors. Overall, ARCTIC Freezer 33 Esports Edition is an attractive, decently efficient CPU cooler, but only for mainstream users. 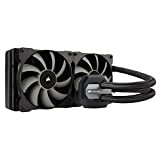 If you are into upgrading your stock cooler, or just want an affordable, but quality air cooling solution for your build, Cooler Master Hyper 212 Evo comes as an utter option. Cheap, easy to install, with a quality build, and most importantly, efficient, this CPU cooler will decrease your processor’s temperature up to 20 degrees Celsius compared to the stock cooler. Cooler Master Hyper 212 Evo maybe isn’t made for heavy overclocking but it is meant for the majority of PC users and it offers the about-right amount of everything. It is compatible with all the mainstream sockets both Intel’s and AMD’s, offers decent heat dissipation thanks to the advanced aluminium heatsink with four heatpipes that are combined with the 120mm high airflow fan, with the rotational speed of 600-2000RPM, nice clearance, decent design… as mentioned, there is everything that should be there. Cooler Master Hyper 212 Evo is the best example of great value for money and the proof that the low price doesn’t necessarily mean a poor product. CORSAIR Hydro Series H115i is a cooler that is, according to its performance, in the group of entry-level liquid coolers, but according to the price, among the top-notch ones. Equipped with the 280mm radiator, with dual 140mm ML (Magnetic Levitation) PWM fans, this cooler delivers performance very close to the Cooler Master’s Master Liquid ML120R RGB and be quiet! Dark Rock Pro 4, which is among the better air cooling solutions on the market. In other words, its performance is good, but nothing spectacular. Simple to install and fully compatible with the Corsairs LINK software, CORSAIR Hydro Series H115i allows for easy setting and almost completely silent performance when the fan speeds are set between 600 and 900RPM. Good looking, silent, with average performance, outfitted with discrete RGB lighting, CORSAIR Hydro Series H115i presents a decent liquid cooling option for the AMD fans (it only supports AMD sockets), but only until you see its price tag. At a similar price, you can get the almighty Kraken 62, which automatically makes the whole purchase of a CORSAIR Hydro Series H115i rather questionable. Reliable, with a 3-year warranty and with one of the strongest pumps on the market, DEEPCOOL Gamer Storm Captain 240 presents a proper alternative for the mid-budget users. Its performance isn’t among the best in its class. 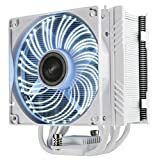 On the contrary, it is in the lower part of the ladder; nevertheless, its noise levels are among the lowest, which puts this liquid cooler in the dead center of the dual-fan AIO coolers offering. 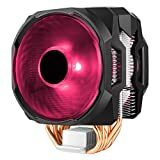 DEEPCOOL Gamer Storm Captain 240 is compatible with all the newer sockets from both AMD and Intel and is equipped with a great looking red LED light that just adds to its excellent value for the money and makes it an even more attractive solution for the PC devotees and overclocking fans. This cooler is outfitted with a 280mm radiator and dual 120mm PWM fans and offers great durability that will be well-appreciated by the cost-conscious system builders. Overall, if you are looking for silent, average performance and charming looks for an appealing price, DEEPCOOL Gamer Storm Captain 240 is a great choice. If you want the best CPU cooler that exists on the market, there is only one option and that is the all-powerful NZXT Kraken X62. 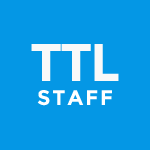 Top-notch performance and extremely low noise levels are its trademarks. 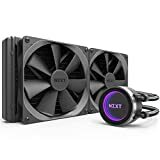 In the case of NZXT Kraken X62, nothing is left half-finished and you are getting a premium product with plenty of features that include advanced lighting, special CAM software for cooler settings, but also GPU overclock, 6-year warranty and much more. This amazing liquid cooling device comes outfitted with a 280mm radiator, with dual 140mm fans that have a rotational speed of 500-1800RPM, offers full compatibility with the majority of Intel and AMD sockets and comes with a highly attractive RGB lighting – one of the best you can find, to be precise. Amazing looks, superb performance, quiet operations, numerous features, NZXT Kraken X62 just has it all. EVGA CLC 240 Liquid/Water CPU Cooler is a liquid cooler that combines exceptional performance and durability with a highly appealing price. Compatible with a vast number of sockets, including the Threadripper and coming with a nice 5-year warranty, this CPU cooler is among the best mid-range picks you can get for your money. Thanks to the sleeve tubing and 280mm radiator outfitted with the dual 120mm fans that have a speed of 500-2400RPM, EVGA CLC 240 produces great cooling performance at both low and high fan speeds. 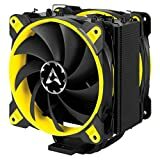 Unfortunately, with the rise of the fan speed, it also raises its loudness, but since this cooler is very efficient, those values shouldn’t be reached that often. EVGA CLC 240 also has RGB light on the pump, controllable through the special EVGA Flow Control software; however, fans themselves are “spared” of this addition, which minimizes the impact of this cool feature. Overall, EVGA CLC 240 is an excellent cooler with a great performance per dollar ratio and an affordable option for both demanding overclockers and people looking for a quality cooling solution. If its size isn’t a problem, Thermaltake Floe Triple Riing RGB 360 can be a very helpful tool in restraining your CPU temps. With the help of the 360mm radiator that is equipped with three 120mm fans, with a rotational speed of 500-1400RPM and attractive RGB lighting, this cooler presents a great combination of performance (similar to the best 280mm radiator coolers) and a compelling appearance. Thermaltake Floe Triple Riing RGB 360 is relatively easy to install, it is compatible with most Intel and AMD sockets and it comes with the TT RGB Plus software dedicated for the full control over its lighting and synchronization with other components. Unluckily, its price tag makes it not really affordable, but on the other hand, if you want a premium performance, the lowest possible noise levels and a great appearance, that has its cost. Overall, if you have a large enough case, demand for a great performance and enough money to buy it, go for it – you won’t be disappointed. Will the EVGA CLC having the socket for an 1151 fit on the new 8th gens that are 1151 (300) socket? Yes, it will fit. You can also try to assemble the PC at pcpartpicker.com just to double check if all your components fit. Ok. I used the partspicker site and I selected the corsair h100j v2 and MSI MEG ACE 1356 board. The site says it fits but according to Corsair’s tech support, they do not support any 1356 board for any of their products. I cannot find any type of system like the Corsair’s h100i v2. Do you know of any actually tested liquid cooler for 1356 Intel boards? If it fits 1366, it should fit 1356. At least based on this thread https://linustechtips.com/main/topic/774584-lga13561366-cooler-help/. Still, we personally didn’t test this so it’s always better to double check with the manufacturer. Why Do You Need a CPU Cooler? 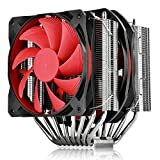 Why Upgrade a CPU Cooler?